It seems a bit silly to be writing about this on my blog as I expect the only people who even visit this place are already folks who are interested in family bicycling-- you know the whole 'preaching to the choir' thing. But as the Kickstarter campaign for LESS CAR MORE GO is in its final week with $8,000 more to go to be funded, I feel like I would be remiss if I didn't say share why I think this documentary is important. Anyway, back to LCMG-- filmmaker Liz Canning came up with this incredible idea for this documentary and it's not just about the bikes. She is creating a crowdsourced film where she called for footage from ordinary folks from all over the country and beyond. That means us non-filmmakers shoot video when out and about on cargo bikes, and we convince our friends who ride to let us interview them on camera. Then Liz watches hours and hours of all this video from all these many people and she is putting it together in one coherent story. It's an incredibly ambitious project and it's just really cool and I have no doubt that other documentary filmmakers will look at this example and come up with their own ideas for crowdsourced film projects. Liz's approach to this project speaks so much about the power of community. Crowdsourced and now crowdfunded. This film cannot happen without the crowd. The other reason why LCMG is important is about the bikes and the families who ride them. I think back those six years ago when we were trying to figure out how to get kindergarten-aged twins to/from a school two+ miles away from our apartment and it just didn't seem right to use the car. Yet, they couldn't walk and they couldn't ride themselves and a bike trailer wouldn't work and there was no public transportation available for this route. There didn't seem to be a solution until one random weekend when a friend from another place whispered the word 'bakfiets' and we Googled it and suddenly-- Wow! This amazing machine. Look at these families on the web who were using these cargo bikes to transports kids and not just a single kid, but more than one kid. And the possibilities opened up to us-- possibilities that we didn't know existed before we heard the words 'bakfiets' and 'cargo bike' and saw those photos on the web and read the blogs of Travis, and Anne and Tim, Julian, and Matt. So this is why LESS CAR MORE GO is important. It's about the possibilities. 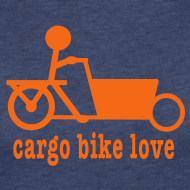 Other families who may not live in a place with a family bicycling culture can watch this film and think-- Well, maybe…. Maybe if that family does that, maybe we could. And it's also important for the families who already do ride their bikes as it's about community as well. Maybe that family also doesn't live in a place where others ride. They're the outliers-- maybe even the ones that other parents look at and even sometimes comment on "how crazy or dangerous they are to be bicycling with their children." Those bicycling families can look at this film and think-- Well, we aren't crazy. We aren't the only ones. There are other families like ours getting around their communities on bikes. As parents, we can feel unsure and we can hear criticism about our parenting choices pretty darn loudly and we can question ourselves and our choices. Seeing others out there riding with their kids feels good. This feeling of belonging is powerful. I hope the world gets to watch LESS CAR MORE GO. And I hope I do, too.